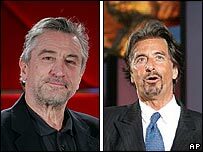 Movie legends Al Pacino and Robert De Niro are to share the big screen for only the second time in their careers, according to film trade paper Variety. The stars have signed up to play police investigators hunting a serial killer in thriller Righteous Kill. Producer Randall Emmett said the movie was set in motion by the two actors. "They're friends, and this really all got started from that," he said. Unlike their last film, 1995's Heat, the duo will act together throughout. In Heat, they only had two scenes in common - while in 1974's The Godfather Part II, their characters never met on screen. "This is an event in world history," said co-producer Avi Lerner in Cannes. "They were in two scenes in Heat. In this movie, they are in the whole thing together." Righteous Kill, which has a reported budget of $60m, is being written by Russell Gewirtz - who scripted last year's hit heist movie Inside Man. Casting is under way for other roles in the project.